With the change in style and trends every now and then, there are so many different types of designs available for the wall and ceiling design of your beautiful living rooms that you yourself would be in dilemma about what to select and what to reject. These styles and trends start varying from the colour scheme to the materials to the design to the styles to the themes and the endless list goes like that. Since the living area actually presents the real identity of your whole house to the first - time visitor of your place, it is very important to take a keen interest while you design this space of your place. Here I present some of my latest ideas going around in the market so as to make it easier for you to select the kind of style you actually require for your place. Since white never seems to be out of fashion, it is a great idea to use white in your living area that showers peace all around giving a very rich aura to space. The wall has a fireplace with the details of classical touch making it the main foci of the entire place. The ceiling design is kept totally in design with the chandelier used without making any extra efforts to give the ceiling an integrated look with the place. Floor is covered with the patterned carpet unlike the walls and the ceiling which area kept simple and smooth. Wood is the major material that is used here. The naked roof truss not only gives a very interesting look to the entire living room layout but it also makes a very bold, dramatic and an impactful impression. The light coloured wood panelling is used on the walls with the contrast of dark coloured wood used in the roof truss. The fireplace is the most pop up feature where the entire rubble work is done so as to create a merge feature with the entire surroundings. It isn’t always required to put designs and frills in your design, sometimes the simplicity wins the eyes of the beholder at the first glance. The use of only three colours i.e. yellows, whites and browns clearly define the picture without using any extra colour. 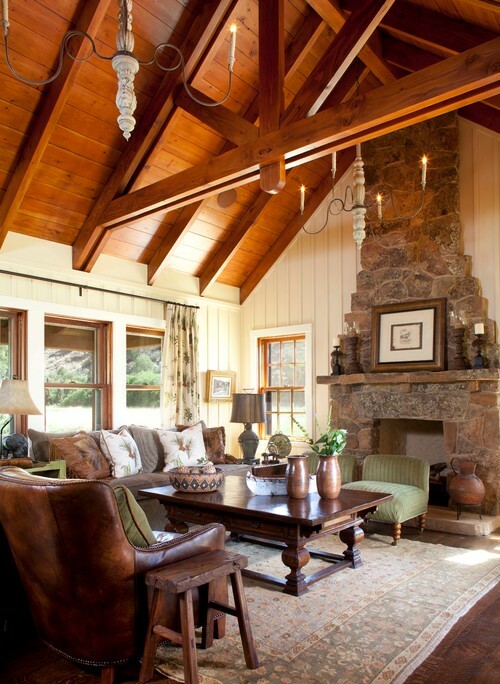 The brown panelled wall of a portion is used as a highlighter of the entire living area with the use of beautiful light fixtures and fireplace. 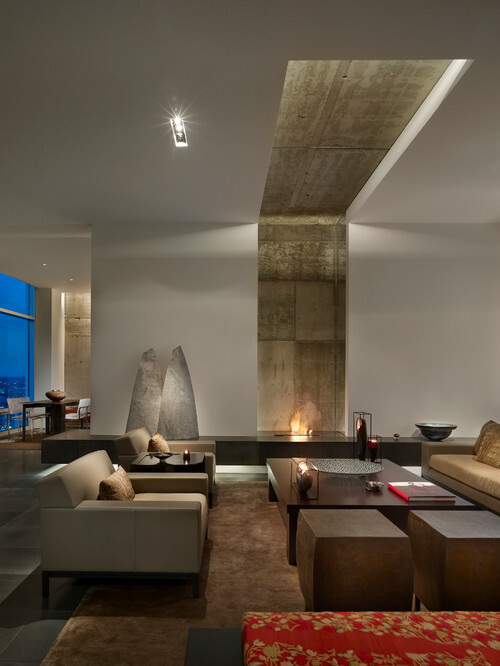 The walls and the ceiling are totally simple and same that creates an illusion of large spaces in the interiors. The dark brown polished wooden flooring and the same type of ceiling creates a very rich kind of aura in the living area. The white coloured used in the walls, windows and furniture acts as a highlighter of the place. All the wall elevations are different from one another which are totally in integration with the ceiling and the flooring. 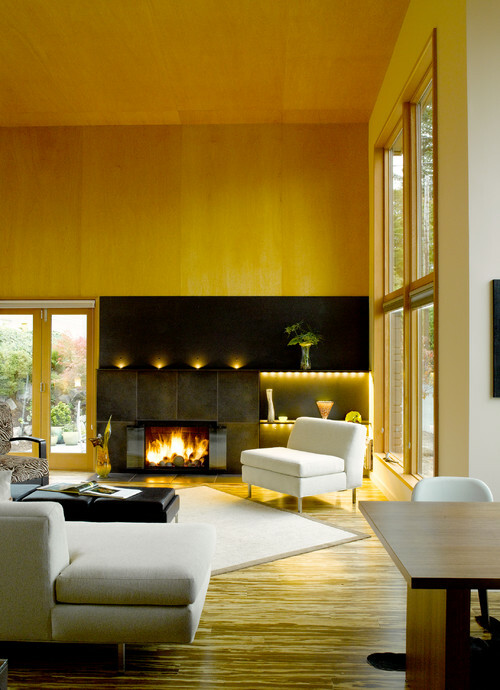 The contemporary style of the living room makes it a perfect fascination for the viewer. The vertical strip that flows from wall to ceiling creates a very transitional and minimal effect in the premises. The overall impact is quite simple and the furniture that is placed creates a sense of perfectionism and easily goes with the versatile and practical interiors. Similarly, the flooring adds the more charm and glamour to the décor. The royal décor of the living area is one thing that everyone wishes to have. The colours, the designs, the furniture, the lighting, and everything is just so perfect. The ceiling is kept quite simple so as not to create any clutter between the details of being so royal. 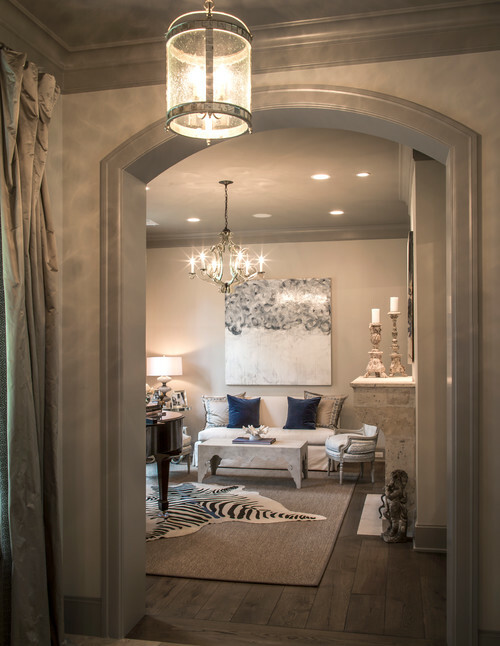 The flooring is semi-covered with the tiger print carpet creating a real sense of being so royal and classy. The chandelier creates the jaw-dropping effect on the overall interior design of the living area.